Inhaling dust that results from construction projects can cause a host of problems for home or business owners. This is particularly dangerous during the process of floor removal due to the large volume of dust created during these projects. For every square foot of tile that’s demolished and removed, up to a pound of dust is created and released into the air. Inhaling dust from tile or wood floor removal can be dangerous, leading to anything from minor irritation to chronic illnesses. When a tile or wood floor is removed, contracted professionals generally use jackhammers, scrapers, and grinders to chip away at the flooring. Once the tile or wood is removed, the grinders smooth out the surface beneath so that a new floor can be properly installed. This process creates a lot of dust, which can end up in the air inside of the building or on surfaces throughout it. This dust is often primarily made up of materials like silica, a mineral commonly used in tile. Prolonged exposure to dust can lead to long-term damage, and can potentially be fatal. Protecting yourself, your family, or your employees from the hazards of inhaling dust during a floor removal process is essential. In order to prevent the consequences of inhaling dust, it is necessary to cut down on or even eliminate dust output during floor removal. 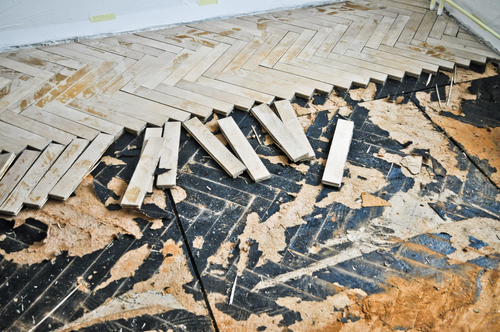 Traditional methods of floor removal involve techniques like chipping and grinding, which produce fine dust particles that can be difficult to remove. Fortunately, there is a solution. Floor removal systems that utilize industrial vacuums at the source of tile or wood removal prevent dust from getting into the surrounding environment by eliminating it before it is released into the air. This is the best option for getting rid of the dust that is created during floor removal. Not only does this method protect the surfaces and furniture in your home or business from being covered it dust, it protects the health of everyone who spends time in the building. Dust-free floor removal cuts down on the cost and time it takes to prepare a space for the process, protects the property and building from damage, and eliminates the time-consuming clean-up usually associated with floor removal. Most importantly, it allows your family to stay in the home or your business to remain open during floor removal because it protects the health of both the workers and the client. If you need flooring removed, there is no need to put your health or the health of your family or employees at risk. For efficient, professional, and dust-free floor removal, call DustBusters today at 866-883-8783.